File image of AIMIM chief Asaduddin Owaisi. Hyderabad, March 18: AIMIM President Asaduddin Owaisi Monday filed his nomination papers for Hyderabad Lok Sabha constituency, seeking a fourth straight term in the lower house of Parliament. 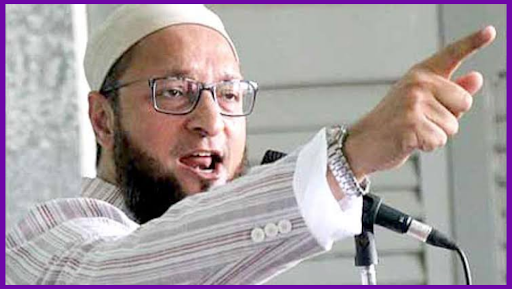 With the ruling Telangana Rashtra Samithi (TRS) making it clear that it would back his candidature, Owaisi seems to be on a strong wicket in this Muslim-dominated segment, a stronghold of the All India Majlis-e-Ittehadul Muslimeen. The Congress and the BJP are yet to name their candidates for this constituency, represented by Owaisi since 2004. The Telangana Pradesh Congress Committee had earlier recommended to the party central leadership to field Mohammad Azharuddin, among others, in Hyderabad constituency, but party sources have indicated that the former India cricket captain is not keen to contest here. Asaduddin Owaisi Attacks Centre Over China's Stand on JeM Chief Masood Azhar in UN. Alhamdulilah, filed my nomination papers today. The TRS and the AIMIM have teamed up to face the Lok Sabha elections jointly in Telangana. Owaisi is expected to campaign for TRS candidates, according to TRS sources. "Hyderabad Parliamentary Constituency has been the voice of India's impoverished, oppressed & weak. Inshallah, it will continue to be so," he tweeted after filing the papers. In the assembly elections in December last year, AIMIM had won seven of the eight seats it had contested. They party had supported the ruling TRS in the remaining 111 segments.